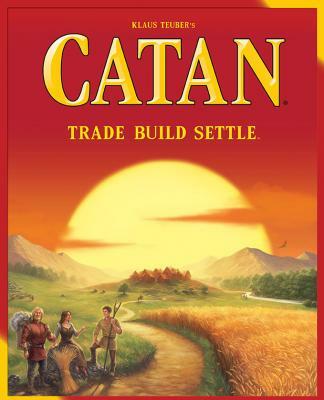 • In The Settlers of Catan, players try to be the dominant force on the island of Catan by building settlements, cities, and roads. On each turn dice are rolled to determine what resources the island produces. Players collect these resources (cards) - wood, grain, brick, sheep, or stone - to build up their civilizations to get to 10 victory points and win the game. • A turn consists of possibly playing a development card, rolling the dice, everyone (perhaps) collecting resource cards based on the roll and position of houses (or upgraded cities - think, hotels) unless a 7 is rolled, turning in resource cards (if possible and desired) for improvements, trading cards at a port, and trading resource cards with other players. If a 7 is rolled, the active player moves the robber to a new hex tile and steals resource cards from other players who have built structures adjacent to that tile.